Transform your guitar into a sitar! The Electro Harmonix Ravish Sitar Guitar Effects Pedal transforms your guitar into a sitar with a variety of tonal options and presets. The Electro Harmonix Ravish Sitar pedal provides an extensive range of options for making guitars, and most other stringed instruments, sound like a sitar. The Ravish Sitar recreates the sound of both a sitar's sympathetic strings and its lead strings. There are two outputs - a main output which incorporates both sympathetic and lead strings, and a sympathetic only output which allows you to send the sympathetic strings signal to one amp, and the lead strings signal to another. The key and scale of the sympathetic strings can be set to major, minor or exotic, and a hold of the left footswitch provides a drone to play melodies over. Users can also customise their own scales, and transpose scales to other keys. 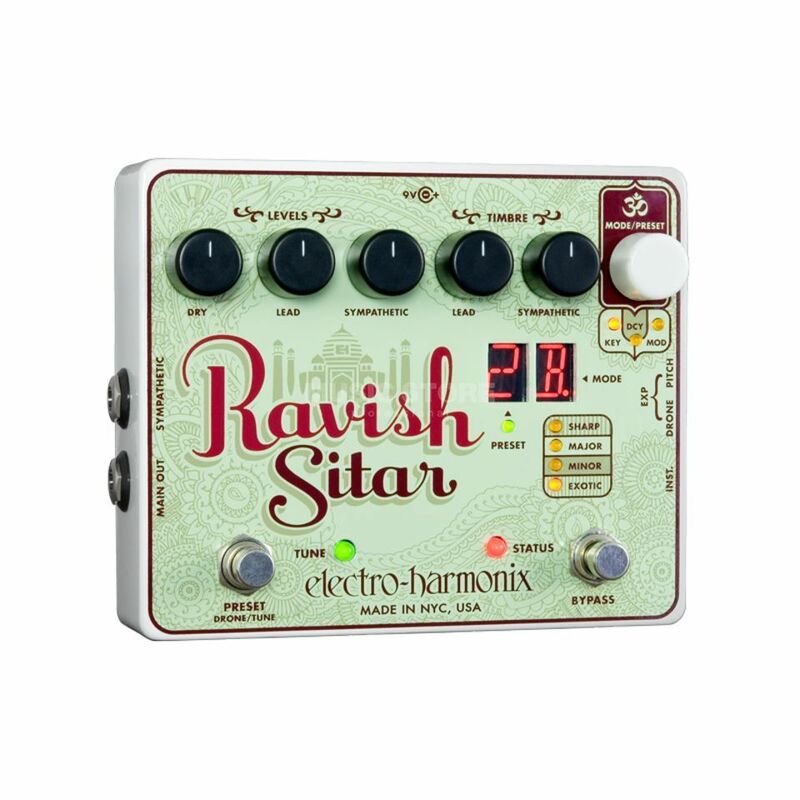 The EHX Ravish Sitar has controls for mixing in the dry guitar signal, the sympathetic signal and the lead signal. There are also controls to change the timbre of the lead and sympathetic signals, ranging from a buzzy tone through to a dull, more rounded sound. With Decay and Modulation modes adding to the Ravish Sitar's capabilities during live performance, as well as the option to plug in an expression pedal to add pitch bends, the Ravish Sitar has an incredibly deep set of features.